The albums currently represented in the playlist are Numbers (CS 201 cd) with Richard Barrett [more info (get the CD)…]; io 0.0.1 beta++ (SLAMCD 531) with Bruce Coates and Franziska Schroeder [more (CD/download)…]; and Mathilde 253 (SLAMCD 528) with Charles Hayward and Ian Smith plus Lol Coxhill [more (CD/download)…]; with more to come. 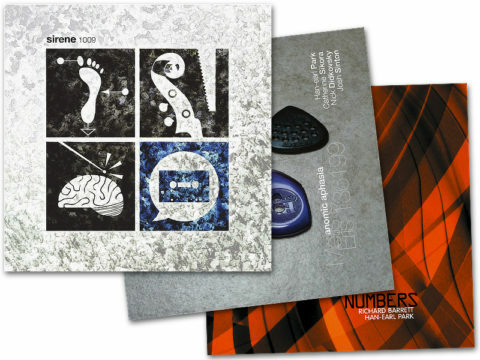 09–22–14: embedded playlist starts with Numbers. Just added one more item to the playlist. Added a trailer for the download releases with Paul Dunmall, Mark Sanders, Murray Campbell, Randy McKean, Gino Robair, Marian Murray, Jin Sangtae, Jeffrey Weeter, Franziska Schroeder, Catherine Sikora and Ian Smith. btw, the formal releases are available from your favorite AWESOME record store (some of these are also on iTunes, eMusic, etc.). I recommend Squidco and Downtown Music Gallery.